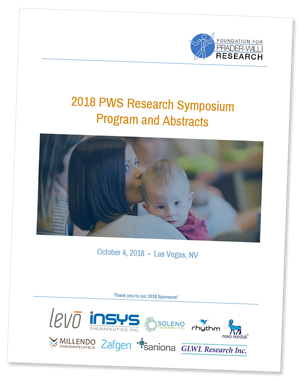 FPWR’s 2018 PWS Research Symposium took place in conjunction with the FPWR Annual Family Conference on Thursday, October 4th in Las Vegas, Nevada. This download is a collection of abstracts describing all 22 speaker presentations and 22 poster sessions featured at the event. These presentations represent FPWR funded projects and a variety of PWS topics and research findings from genetics and cell biology of PWS, clinical studies, PWS mental health, and more. Fill the form to get summaries of presentations on the latest PWS research.